Thinking outside the Box with a car magnet! Well maybe, inside the box. For an author, marketing is something we are continually working on. I enjoy finding blogs that think outside the box on promoting. Some of the ways I have promoted are on blogs, featured in interviews, social media and so forth. But today, I am trying something new, thinking outside the box by broadcasting my work inside the box, that is putting my work inside a (box) frame of a car magnet. Yes, a car magnet, the one that sticks onto the side or back of your vehicle. God can give us witty inventions, so I’m trying one. My husband works in a metropolitan, driving almost an hour a day to work on a major interstate. Yeah, we love the country life. So, I got this idea. He is on a super busy interstate twice a day at least an hour at a time depending on traffic, so why not advertise my book with a car magnet. It would be seen by almost a hundred people a day, if not more. Even if, you don’t travel a major interstate, I believe it would still promote your work in everyday travel and would be a plus when you went on vacation. Just make sure that you have a few copies of your book with you. Who knows you might just sell them. This is my short tidbit on thinking outside the box with book promotions. Thank you Esther for the Guest Writer Spot featuring, “Thinking outside the box,” book promotion. I’ve gotten quite a few thumbs up from passer-by’s on my car magnet! It’s Friday and time for my Guest Writer Spot. If you’d like your writing to appear on this page, please contact me here or by e-mail: esthernewtoneditor@outlook.com. I accept stories, poems, articles – in fact, anything and everything. All you have to do is make sure your prose is no longer than 2000 words and your poems no more than 40 lines. Yay! 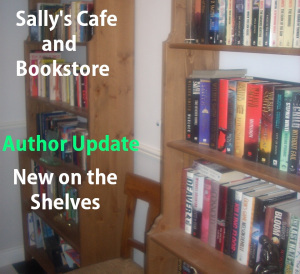 My books are on the bookshelf at Sally’s Cafe and Bookstore! Delighted to welcome Brenda Scruggs to the Cafe and Bookstore with her book Many Hats of a Lady: Ladies of Entrepreneurship released in October 2017. After the war between the North and South, in a time that seemed impossible to mend division, can Lacey Mills and Daniel Bartlett be able to let their differences dwindle to let love flourish. When an opportunity presents itself for Lacey Mills to follow her dream, she didn’t think twice even though, it would take her to the South. A place she never thought she would go since it claimed the life of her father during the war. Yet, her hands had designed some of the prettiest hats that anyone had seen and her dream was in reach. But, would her dream turn into a nightmare after encountering Curtis Kirkland. Awesome website! Getting my material ready to submit! If you are not already in Sally’s Cafe and Bookstore you may like to take a look at what you as an author will gain by being there. Please read the section on what I need to do this effectively both before and after the promotional post. Apart from being one of over 200 other authors on the shelves you will be able to share your new releases, great reviews or offers in one of the twice weekly updates on Monday and Friday. This post is shared on my network of over 28,000 contacts. The key is the fact that many of those contacts will share on their own networks giving you access to thousands more potential readers.